Although most of the Crisps were broken, there were still plenty to get a crunch going with. The first two or three bites were hefty, meaty munches, but as with most thickly cut Crisps of this nature, they reduced at a reasonable rate towards the mushy state required for swallowing. These were thickly cut Ridged Crisps, that had medium width ripples. Most of the bag's constituents were broken, but there were some medium sized, whole Crisps. The texture had a rugged seasoning powder surface, that hinted towards an orangish glow. A Nose Plunge Test revealed a generic Indian sort of aroma; maybe a little cumin based. This was confirmed by the ingredients list. 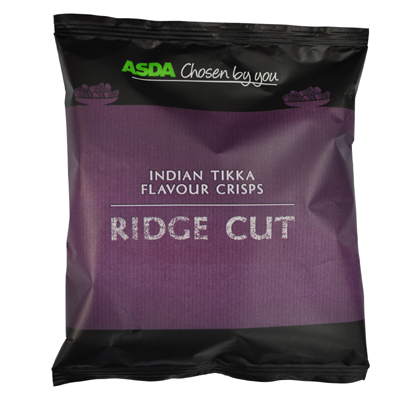 At first taste, there seemed a similarly generic spicy Indian meal type of flavour, but a few Crisps in and the Tikka flavouring that is synonymous with one of Britain's most popular curries bounced through. There was also a spicy after-taste that was hotter than most Chicken Tikka Marsala dishes.